So, we are pregnant with twins. We have our volvo which the wife will drive for the most part, and are selling her Mini. I'm going to buy a forester I think for the times when we need to drive everyone including the dog somewhere. Otherwise, it will be my daily driver. The legacy will still be my toy. I'm looking at Forester XTs. What years do you guys recommend? Any reason I should look for an 06-08 instead of an 04-05 or visa versa? The 09 generation I think is a bit out of what I want to pay for now. Since I've been down the Forester path, I'll reply. The '04-'05 used the same block (different turbo, heads and intake manifold, from what I've read) as the STi and will suffer the same issues as ringland failure and other related engine ills. Search for STi engine failures and you'll likely come across related Foresters w/the same. And don't overlook old TD04's failing @ 125K and dumping their guts into your engine....w/none-too-pleasant results. Plus the oil feed line filters, valve issues, and other related fun. The '06 has the same EJ255 as the WRX, Legacy GT/XT/BAJA, although still similar to the STi's EJ257. The EJ255/7 wasn't changed much from '04-'12. The good news is the engine doesn't seem as susceptible to the HG issues of the NA variety, and most '02-'07 STI/WRX parts are bolt-ons, if you choose to mod. Regardless of the year, make sure you fully test-drive the 4EAT model (if you're inclined to go shiftless) for your tolerance level. I'm just not impressed w/the AT on any turbocharged Subie I've ever driven......L...A....G.....G....Y. And getting a tune and upping the power levels tends to exacerbate the condition. Admittedly, I used a COBB AP w/just an online tune - not a full Pro Tune on a dyno. The 5-speed is the better way to go. So, beware of the turbocharged XT model as noted above and read up more on Subaruforester.org.....If you gotta have one, and can deal w/the potential issues, I still think they are a great overall ride. I have also considered a Forester with twins, back in the day. The first, and insurmountable, problem with any '97-'08 Forester (and Impreza) was that for the first year or so - when the car seat are rear facing - the rear seats do not have enough depth. I had to move the drivers seat up to an uncomfortable position to make room in the back. After the first years when the car seats can finally be put in the normal front facing way this particular problem goes away. Also, Legacy based cars have about 4" more rear seat depth and do not have this issue as bad. +1 that's why we got rid of our forester for an outback. Rear facing seat didn't fit. Yeah I've gotta say that the Forester has very limited room in the back seat. Hmm, good input. I actually wasn't too aware of the ringland issues. I have a lead on an 07 and an 04. The 04 has a brand new turbo, never modded, and basically a new engine. The owner said he had the dealership fix everything including rings, gaskets, pumps, etc. I'm waiting to get some paperwork from him. The 07 looks to be a nice car, although I think they added a smog pump those years instead of having a catted uppipe and that sounds like an expensive part to fix when it goes out. So for those of you complaining about space in the forester - I ruled out the outback because I have a Bernese Mountian Dog we take with us many places, and the outback seems to have less headroom in the back, although more floor room. How tall are you guys that have problems. I'm 5'11'' or just shy of it, and my wife is 5'5'' with short legs. I think I'll take a car seat and go test fit it into a forester if I can find one in the area of the same year. I'm 6'. The front seats are fine unless you move them more than halfway forward. The back seats are a tad cramped specifically. 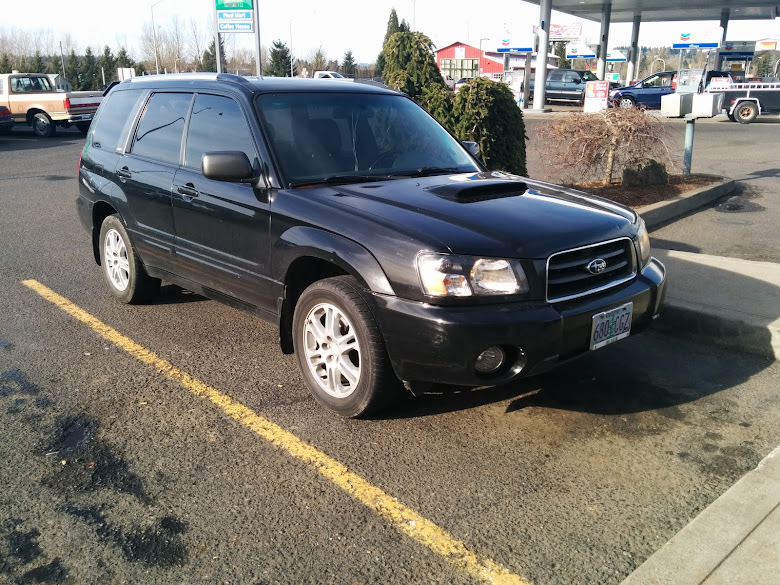 The previous owner of my 04 indicated that they were getting a new car because the forester was too small for their two boys. Thanks for the input guys! We test fitted the car seat in an 07 and an 04. I guess they are the same dimensions in the cabin. I'm pulling the trigger on an 04 outside of Portland this weekend. The car should work for us for a little while until we decide we need to get something larger. Time will tell when that will be. Good luck! 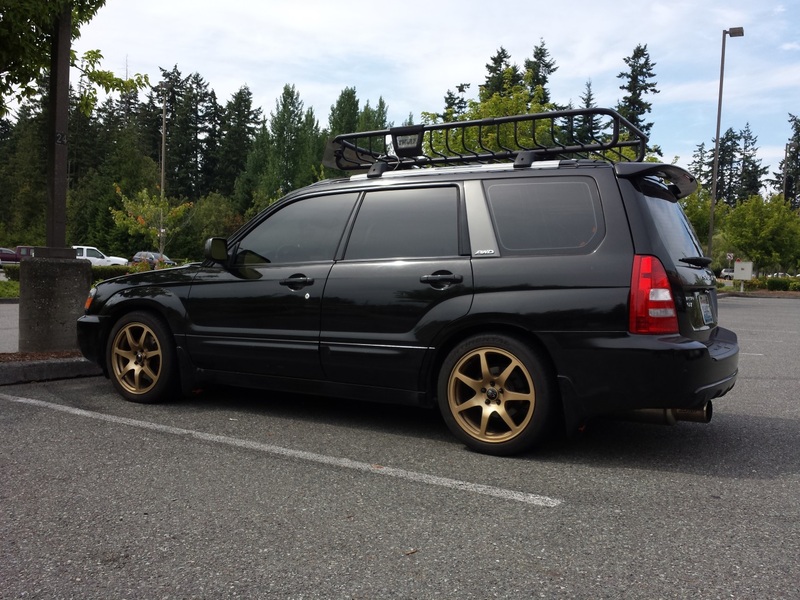 Get on the forester forums as well, there's a lot of good information on there. It's not legacy central, but the people are relatively decent. Very nice! We're twins now! Make sure to put up a journal at subaruforester.org too. I'll keep an eye out. Shoot... I think I'm going to need to get an XT as a daily sometime in the future.